* Cat6a is defined at higher performance than Cat6. Category 6 cable is a cable standard for Gigabit Ethernet and other network protocols. This cable supports up to 600 MHz and is suitable for 1000BASE-T / 1000BASE-TX (Gigabit Ethernet) and 10GBASE-T (10-Gigabit Ethernet). * Our cables are made of bare copper wire as opposed to copper clad aluminum (CCA) wire. Our Cat6 bulk cables are used by major data centers around the world. * SSTP/SFTP: Foiled and screen shielded cabling between individual pairs and four pairs as a whole can prevent electromagnetic interference. 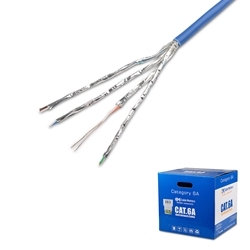 This Cat6a bulk cable is for in-wall installation and is not suitable for assembling patch cables as the 23 AWG conductor can't fit into RJ45 modular plugs.